← Pucker up: 2015 is looking deliciously sour! When I find my vegetable drawer filled with little bits and pieces, I usually whip up a quick frittata for lunch. Yesterday, I was about to do just that, when I remembered I had transferred a half a can of coconut milk into a glass jar earlier that day. Then I remembered that little knob of ginger that I always have in the freezer. I immediately thought about how much I love Thai soups; they are so fragrant and flavourful. In less than ten minutes, including chopping time, I whipped up this quick gluten-free recipe. It took even less time to devour it. It’s a very flexible recipe so go ahead and add in whatever you’d like to use up such as grated carrots, sliced mushrooms or diced celery. This soup can actually be made in under ten minutes and can accommodate whatever odds and ends you need to use up . Its fantastic flavour is inversely proportional to the minimal effort it takes to prepare. Heat vegetable oil in a medium-sized pot. With burner on medium heat, add ginger, onions, red pepper and zucchini. Cook, stirring, for 2 minutes. Add chicken broth and chili garlic paste; stir and cook for 1 minute so flavours can blend. Add shrimp or chicken; cook at a low boil for 2 minutes. Stir the coconut milk and add it to the soup along with the lime juice. Heat till just about to boil (approximately 1 minute). Ladle into two bowls and garnish with coriander. Serve with lime wedges. 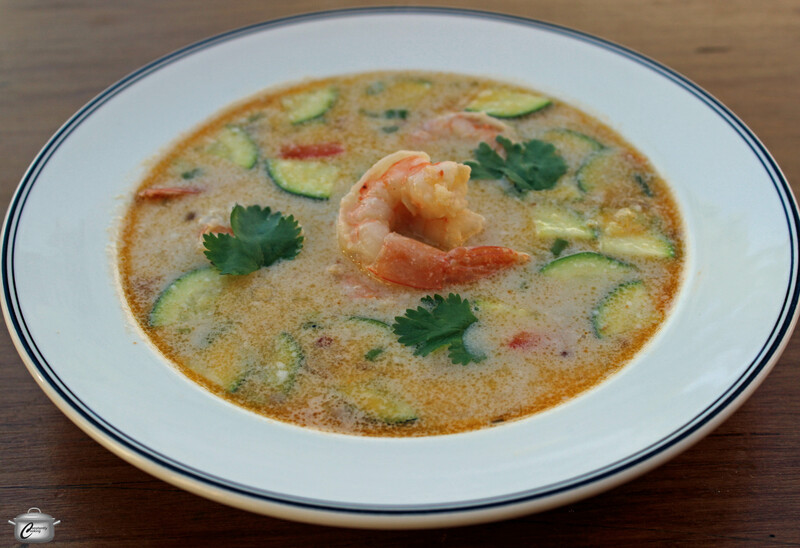 This entry was posted in Soups and stews and tagged chicken, chicken broth, cilantro, coconut milk, fast, fish sauce, ginger, gingerroot, gluten-free, green onion, lime, quick, red pepper, shallot, shrimp, soup, ten minutes, Thai, zucchini. Bookmark the permalink. Thank you – it is a favourite of mine!